As the name of the place itself suggests, one experiences the exquisite beauty of Mother Nature here. The literal meaning of 'Chokka' is that which is beautiful, neat and tidy. 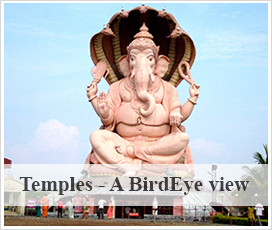 And now, that 'Chinmaya Ganapati' is residing there, the place has its own charm, since the colossal form of the Lord, measuring nearly 45 feet from the ground, captivates every heart that visits the place. Though this is a unique piece of art, one with a pure heart will be compelled to behold the Lord as the 'Living Entity' in this gigantic figure and not just a mere piece of sculpture. 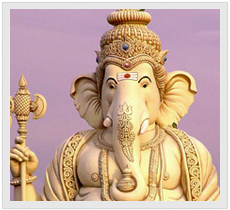 The glory of 'Chinmaya Ganapati' has now spread far and wide in Karnataka. Pujya Swami Tejomayananda consecrated 'Chinmaya Ganapati' on the 24th of February 1998. A Sahasra Kalashabhisheka was organised on a specially erected ramp, and Chinmaya Ganapati took a grand, holy bath, enough to atleast drench quite a portion of his gigantic form.